While George W. Bush is busy fighting "axis of evil" (tm) in the war on terrorism, he's also having to contend with the "axis of complete and utter ignorance" (tm) -charter members of which are France, Germany, and Belgium. But there's another candidate that seems to be gunning for this dubious distinction, and it's none other than the America's largest trading partner and supposedly closest ally: Canada. We here in Washington, DC, are busy loading up on bottled water and anti-radiation pills, duct-taping and Saran Wrapping our homes, and suspiciously eyeing any brown paper lunch bag left behind by a fellow commuter on the subway ride. So what's our buddy to the north -- Canadian Prime Minister Jean Chrétien-doing to help fight terrorism? He's sitting back and allowing for terrorist groups to operate freely throughout the country, even when information obtained by the Canadian Security Intelligence Service (CSIS) bears out this charge. Where even a country like Australia has outlawed immigrants from 40 recognized terrorist groups, Canada has only taken similar action against seven of them: The Armed Islamic Group, The Salafist Group for Call and Combat, Al-Jihad, Vanguards of Conquest, Al-Gama'a al-Islamiyya, Al-Ittihad al-Islam, and al-Qaida. Members of at least 50 recognized terrorist groups are still operating within Canada's borders. Last year, Chrétien's Foreign Affairs Minister, Bill Graham, argued in Canada's House of Commons that not all members of Hezbollah-a radical Lebanese-based group which is responsible for hundreds of bombing deaths and acts of terrorism -- can be banned from entering the country. He argued that the group has a social wing that does good deeds in raising money for charity! Yeah, right. And the Hell's Angels are all about toy drives. Some of the "charitable acts" for which Hezbollah is known include the 1985 hijacking of a US airliner and the murder of a US Navy sailor aboard the flight; the 1993 bombing of a US Marine barracks in Beirut; and the 1994 bombing of an Israeli cultural center in Buenos Aires, Argentina. Back in 1997, Hezbollah member and Saudi national Hani Abd Rahim al-Sayegh arrived in Canada and applied for refugee status. He was subsequently arrested and held as a suspect in a 1996 terrorist bombing that killed 19 soldiers and wounded 372 others at a US barracks in Saudi Arabia. The bomb was twice as large as the one that destroyed the Oklahoma Federal building in 1995. Al-Sayegh was extradited to the US in 1997, and was subsequently indicted by a grand jury in Virginia on 46 charges, including 19 counts of murder. These terrorists have apparently been using Canada's resources in the commission of their heinous acts. A newly-obtained CSIS report found that the Canadian Hezbollah chapter "acquired diverse material for use in the group's armed struggle in the Middle East." In March 2001, Ali Adham Amhaz of Burnaby, BC, was among three people indicted in North Carolina for allegedly plotting secretly to provide services and items to Hezbollah operatives in the Middle East for use in violent attacks. Hey, for all we know, these terrorist groups could be hiding out in Canada and using the country's resources to build the mother of all snowblowers for use in an attack on Washington, DC. Forget about chemical, biological or nuclear warfare. Those of us who live in the area know that a snowblower would be the ultimate weapon of mass destruction to use on the nation's capital. All it usually takes is a decent-sized snowfall to totally cripple the District and shut everything down. And what better place to find the materials to build a snowblower than in Canada's great, white north? 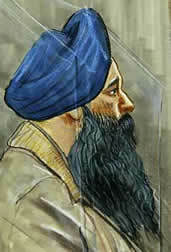 In this climate that promotes tolerance and diversity even at the expense of national safety and security, Canada's court system (and, specifically, BC Chief Justice Donald Brenner) was moved last week to send convicted terrorist Inderjit Singh Reyat to a cushy minimum-security prison -- dubbed "Club Fed" -- just outside of Vancouver. During his upcoming five-year prison stint for having built a bomb that killed 329 people on Air India Flight 182 back in 1985, Reyat will be able to enjoy all the fine amenities that Canada's west coast has to offer-even those that many lower-income Canadians cannot afford. He will have access to a tennis court, a pool table, a jogging path, a golf course, and a private room with a shower. And to top it all off, Reyat will be eligible for day parole in 10 months, and full parole by September 2004. Forget about the fact that Reyat was also convicted in 1991 of manslaughter for building a bomb that blew up at Tokyo's Narita Airport and killed two baggage handlers. Since Reyat had already served more than 10 years in connection with that incident, and given that Canada doesn't impose consecutive sentencing, Reyat was given credit for time served. President George W. Bush is scheduled to go to Canada in May for an official visit. I would like to suggest an appropriate gift for Bush to present to the Canadian PM: a copy of "Terrorism for Dummies". He also may want to tip Chrétien off to the fact that we're actually at war. The PM recently announced that Canada will deploy 1,000 troops in Afghanistan-not to root out terrorists, but instead to participate in a multi-nation peacekeeping force. Hey Jean, why don't we find the peace first, before we bother worrying about keeping it? And while Bush is in town, maybe he can present a few chapters of the "Dummies" manual to some of the country's high court justices? They also seem to be in need of a little education in relation to how to handle terrorists who blow up airplanes and other civilian targets. At least this would be a start. Rachel Marsden is a Director of the Free Congress Foundation.